It’s amazing what we do for our kids. I never thought we’d even had a dog and here I am telling you about our experience with a pet pig. A while back we discovered that our very nervous, very anxious little girl transformed into a new child when she was around animals. Not so much dogs, cats and hamsters but more along the lines of horses, pigs and goats– anything on a farm that doesn’t mind walking around wearing something pink. Since pigs are the pinkest thing on the farm, she naturally started begging for one. We initially laughed it off as something completely unthinkable and then ended up doing our research and ultimately heading to the closest pig farm! It turned out that having a pig as a pet wasn’t the craziest idea after all. We chose a breed of pig that was supposed to stay smaller in size. This is where I feel fully obligated to tell you to do your research before you think about getting a pig. Everyone who truly knows pigs will tell you that there is no such thing as a tea cup or micro pig. 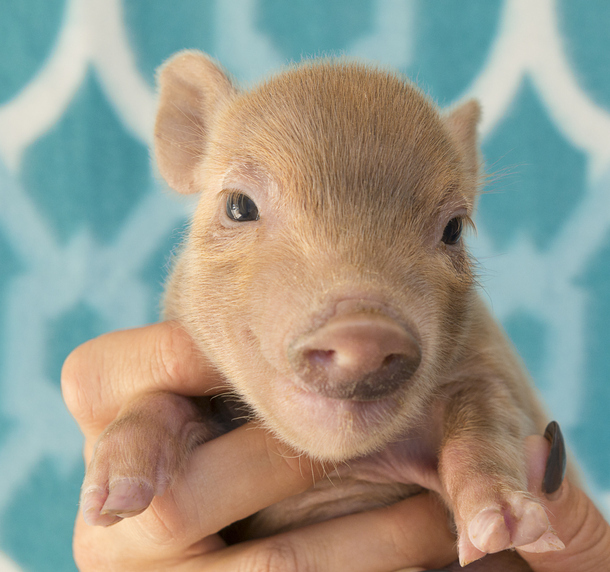 Those cute photos you see are of baby pigs, not fully grown pigs. You can search for a pig whose parents and breed are smaller in stature but that’s about the best you can do to find a small pig. Some of those cute little pink piglets can grow to over 600 pounds. Make sure you check out the background of whatever type you are considering. Now I can climb off my soapbox and say our little pig quickly grew and by about six months was the size of a small dog. Much of what we had heard was very true. She was easy to litter train and very clean. For as much as pigs have a reputation about being messy the opposite is actually true. She’s the least smelly pet we’ve ever had! If you teach them where to go potty and give them space to roam away from that area they will always head back there once trained. My daughter loved to dress our pig in clothes and she was a great little companion for the kids. Never in my wildest dreams did I think I’d be watching a pig in a bikini run through our kitchen at dinnertime but there we were. Like many animals, if pigs are handled by people from a young age they can be easily socialized and our pig tolerated pretty much anything the kids wanted to do with her. After having dogs in the past one of the things I appreciated most was that she didn’t chew on or try to eat things around the house that were not food. Speaking of food though, we had to make sure every cupboard door was shut tight and the trash was never easy to access. Pigs never ever feel full so they will eat and eat and eat. That smart little thing once knocked over the table that held her huge bag of pig food and ate it all! She was moving slowly for a little while after that but I guarantee she would have done the exact same thing the next day if we hadn’t moved her food somewhere else. Overall having a pig as a pet was a great experience for us. They’re loyal, smart animalsWe’re nearly a year into a new puppy and I can’t tell you how many times my husband and I have said that we probably should have just got another pig. The puppy might be more cuddly but the piggy was much less work!